The plan is also to pack lightly, so I might not be able to take 7 foundations, 19 blushers and 101 lipsticks. Hmm. Pack miniatures. Those adorable little bits of skincare that are normally ignored are coming with me in my toiletries case. Oh yes. 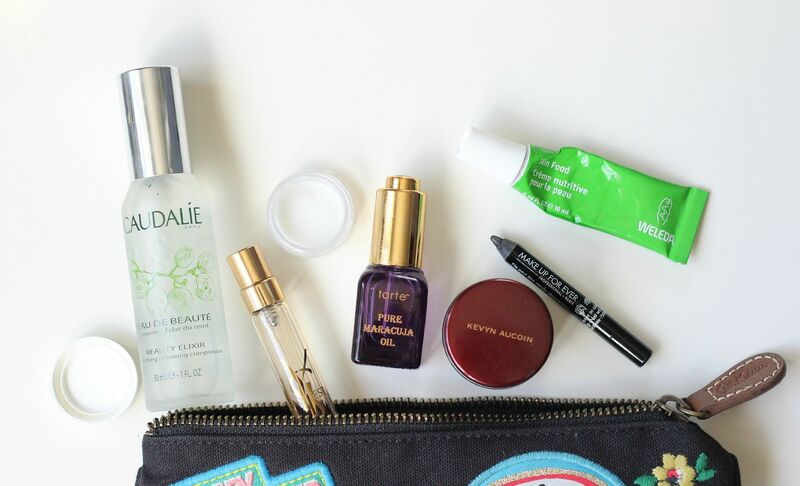 The sweetest bottle of Tarte Maracuja oil, a teeny tiny Weleda skin food, the baby bottle of the Caudalie beauty elixir. So cute. So useful. Pack cleverly. As in, think about where I’m going. Don’t pack 4 shades of ever so slightly different pink lipstick. Do pack one red lipstick that you can wear everyday and feel all swishy and elegant in. Don’t pack straighteners and boring stuff like that. Use multi-tasking products, like the Tarte oil that will be used day and night. Take a cream blusher that I can use for lipstick in the day. See? So well thought out. Hide stuff in Chris’ bag. When I inevitably run out of space in my bag, then it’s almost definitely OK if I sneak a hairbrush, some socks and maybe a book or two into Chris’ bag. He won’t mind. Probably. Tom Ford AW 15 Beauty: Skin Illuminating powder duo + Runway eye colour.